As we look ahead to the new year, this is part two of a two-part post about 2017 happenings with needlepoint belt and accessory pairings….because Brewster Belt Company wants you to look great while you enjoy 2017 (…and show off our endless custom needlepoint design possibilities). Here are some things to look forward to in 2017…. Who doesn’t love Discovery Channel’s Shark Week programming? Stay tuned for the exact dates, but during the summer of 2017, you can turn off Netflix and return to live TV to binge watch these fascinating fish. Show your love with a shark needlepoint belt. The first U.S. total solar eclipse of the 21st century will occur on August 21, 2017. The last visible total solar eclipse in the continental U.S. was February 26, 1979. Totality will occur along a path curving from Oregon to South Carolina, and will last less than 2 minutes and 40 seconds. The location and time of “greatest eclipse” will be on the western edge of Christian County, Kentucky, at 36.9715 degrees north and 87.6559 degrees west, occurring at 18:25 UTC. Fancy a Kentucky state flag belt? Annual National Dog Day will be celebrate on August 26, 2017. It is a philanthropic holiday founded to celebrate all dogs, mixed breed and pure and to encourage adoption of dogs in local shelters. 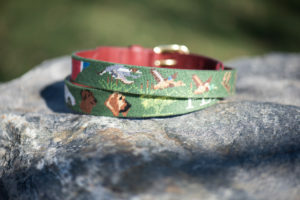 Honor your favorite furry friend with a custom, needlepoint dog belt featuring your favorite dog breed or treat your dog to a custom needlepoint dog collar. Whether you like to hunt duck, wild boar or deer, as you keep your eye on the 2017 hunting calendars, you can show your love for your sport with a custom, needlepoint hunting belt, wallet, flask or dog collar. As summer draws to a close, the beginning of fall brings us back to our regular schedules. For many people, it’s back-to-school season. 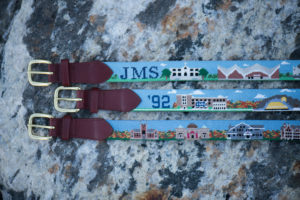 Whether you have kids heading back to school or are going back to school yourself for classes or alumni events, show your support for your alma mater with a custom needlepoint campus belt – available for any high school or college. The historic Head of the Charles Regatta takes places on October 21-22, 2017. Tens of thousands of spectators will line the Charles River from Boston University to Harvard University to watch more than 11,000 rowers compete in 55 different race events. Founded in 1965, the Head of the Charles is the world’s largest two-day rowing event. Be a rowing super fan with a custom crew needlepoint belt or a Harvard University needlepoint belt. On October 26, 2017, thirty years after JFK’s assassination, all records previously withheld are supposed to be made public (unless the President authorizes further withholding). The JFK Assassination Records Collection consists of approximately 5 million pages of records and currently about 88% of them are public. JFK was born in Brookline, Massachusetts. Show your support for the great state of Massachusetts with a state flag belt. The 35th America’s Cup will be hosted in Bermuda with qualifying races starting May 26, 2017. The battle for the oldest trophy in international sport will begin on June 17, 2017. 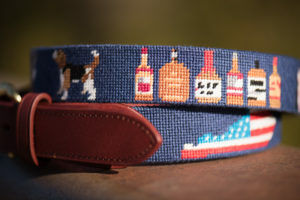 Show your support for the exciting and historical sport of sailing with an early America’s Cup yacht needlepoint belt. Happy New Year from Brewster Belt Company! We hope you have a fantastic 2017! Happy Holidays! We hope you enjoy time with friends and family during the holidays and we wish you a wonderful 2017. Looking ahead to the new year, this is part one of a two-part post about 2017 happenings with needlepoint belt and accessory pairings….because Brewster Belt Company wants you to look great while you enjoy 2017 (…and show off our endless custom design possibilities). And now, 17 things to look forward to in 2017 (drum roll, please)…. New Yorkers are looking forward to the opening of the first phase of the Second Avenue Subway on January 1, 2017. Considering that the project has been planned for almost a century, we’re guessing no one is betting on it. But if you’re a betting man, we’ve got a belt for you. Ok, maybe you’re not looking forward to it, but after an eventful campaign season and election, on January 20, 2017, Donald Trump will be sworn in as the 45th President of the United States. 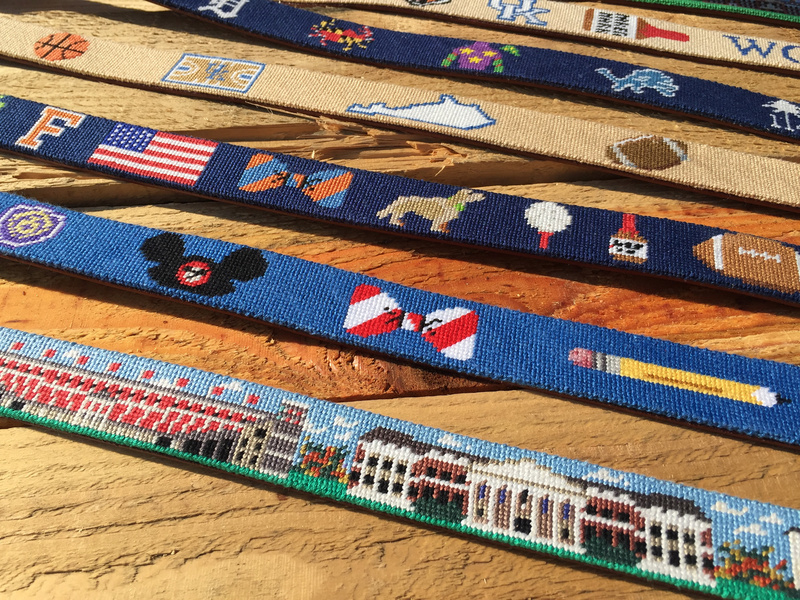 Our designers have created a lot of amazing American and State Flag Needlepoint Belts. Superbowl LI (that’s 51 for those of you who have forgotten your Roman numerals) will take place on February 5, 2017 at NRG Stadium in Houston, Texas. With a few weeks still remaining in the regular season, we have an idea who the contenders will likely be, but anything can happen…. Get a custom needlepoint football belt to support your favorite team or show your non-partisan love for the sport with our featured needlepoint football belt. On a related note, we raise our glasses to the Cleveland Brown fans who stood by their team this challenging year. May we suggest a needlepoint football flask to help get you through the next few games? At least you’ll probably get the first draft pick…. The great state of Nebraska will celebrate 150 years of statehood on March 1, 2017. Planning for its sesquicentennial celebration has been in the works since 2012, so the state should be well-prepared to celebrate like it’s 1867. Get into the spirit with a Nebraska state flag needlepoint belt. On April 7, 2017, six new artists in the “Performer” category will be inducted into the Rock & Roll Hall of Fame. The inductees are: Joan Baez, Electric Light Orchestra (ELO), Journey, Pearl Jam, Tupac Shakur and Yes. And rock on with a rock and roll needlepoint belt! Whether you’re planning a vacation or a staycation in 2017, we hope you fit in some R&R. Either way, you can dress the part with a vacation-themed, custom needlepoint belt. Love SCUBA? There’s a belt for that. Heading to Florida? May we suggest a flamingo needlepoint belt? Or, turn up the heat in your living room and host a beach party with tropical cocktails and a cocktail needlepoint belt to match. Mele kalikimaka. The Kentucky Derby will take place on Saturday, May 6, 2017. But it’s a long road to the Kentucky Derby and qualifying races are already taking place from now through April. If you’re planning to host or attend a Derby Party, it’s never too early to order yourself a festive horse racing belt, so you can sip your mint julep in style. Much of the U.S. has been experiencing record low temps, but the days are about to start getting longer and we’re about half way to summer. Hang in there and check out our fun summer-themed needlepoint belts. 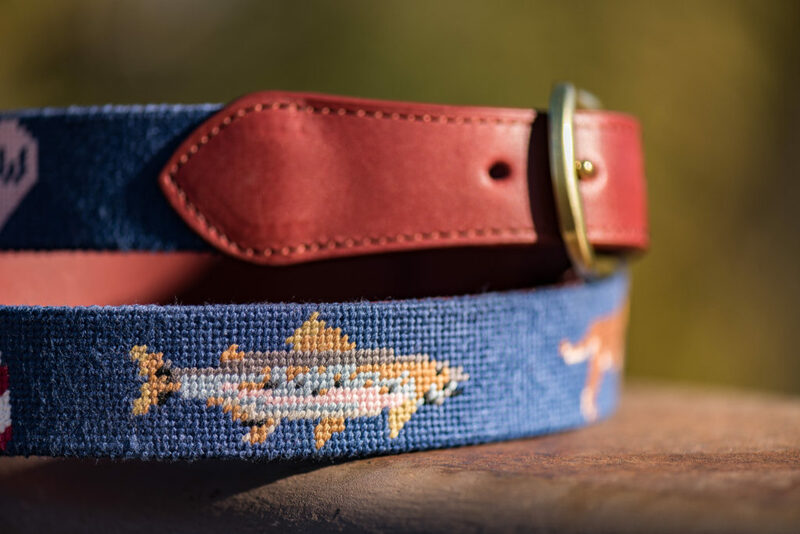 Whether you summer on Nantucket or in your backyard, love fly fishing or paddling, there’s a belt for you. Happy holidays from the folks at Brewster Belt Company and stay tuned for the next post, which will include the remaining things to look forward to in ’17…and the belts to match. Finding unique gifts for those difficult-to- buy-for friends and family members can be challenging and time-consuming. 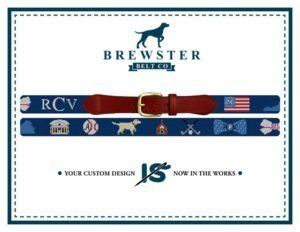 So, before you find yourself flipping through piles of catalogs, fighting crowds at the mall or Googling until you reach the end of the Internet, check out the custom needlepoint belts, dog collars, wallets, pillows, flasks and more at Brewster Belt Company. All Brewster Belt products are hand-stitched and made from top-quality materials. The design team can create virtually any design you can imagine (and even those you can’t). They can also help with design inspiration if you’re suffering from a creative block. Once you settle on a design, within 3 to 5 days you will receive a preview of exactly how your product will look. The team will also work with you to revise the design until you are 100% happy. Since all of Brewster Belt’s needlepoint belts and accessories are stitched by hand (not by machine), many, many hours of work go into each product, which is why there is a 7 to 12 week lead time. We knew you were too clever to let that blow right past you, so allow us to explain…. Although your custom item will not be ready to wrap for the holidays, Brewster Belt DOES provide you with a nifty preview card (shown below) that can be given to the gift recipient. The card has a picture of the exact custom product that is “in the works”. The gift preview card can be printed out and put into a holiday card with a note saying that their custom needlepoint item is being stitched and will be ready in a few weeks. Then, in the depth of winter, after the last Christmas cookie has been eaten and the final Hannukah candle has been extinguished, your friend/dad/aunt/brother/dog/boyfriend will receive…(ta da!) a package containing their custom needlepoint gift and it will be like Christmas all over again. So, let’s summarize. You need a unique holiday gift. Brewster Belt Company can help. They will help you design the perfect custom needlepoint gift for [insert name of worthy gift recipient here]. You will receive a preview card to wrap up and give. Your gift will be carefully hand-stitched and mailed out not long after the holidays. The gift recipient will be thrilled and all will be well with the world. Please note Brewster Belt can provide gift preview cards until December 19th. After that, you’re on your own or you can purchase a gift certificate, so there is hope for you last-minute shoppers. They also offer a returning customer discount, so there’s that as well. You’ve see our homepage add and would like to know how to get a discount on your first order! First of all welcome to the Brewster Belt Company blog! This is where we write about what we’re working on, and this is my first blog post for our new brand (you can read about our needlepoint and company history here). Onto the discount! Basically, we only offer discounts to existing customers. Our motto is that Happy Customers = Repeat Customers and are more likely refer their friends. As such, we’ve always offered a discount to our “best” customers. This is a 10% discount, which can add up to real savings. If this is your first time shopping with the Brewster Belt Company, and you are going to order 2 -4 belts, I highly suggest creating an account and ordering just one belt first. Then, after that order has been placed, you can order the next items with your returning customer discount! Pretty easy. If you have trouble, you can always call us, our toll free number is at the bottom of our website.